Wristguard Flexmeter Plus has double protection 1 splint up onto the hand and 1 splint underneath, next to this the PalmPro which protects the handpalm. 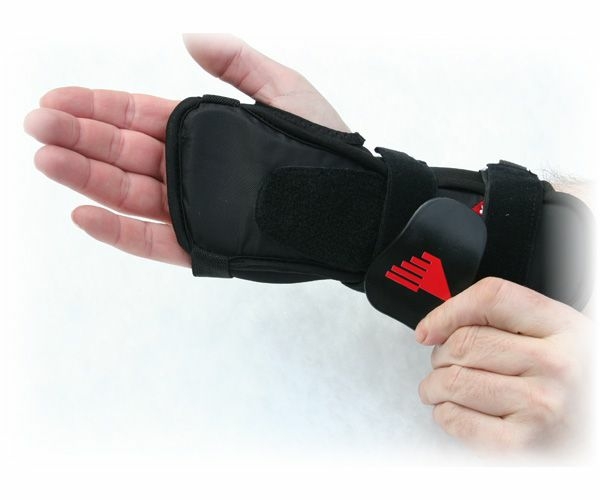 The PalmPro Hand protector can be taken off when the wistguard Flexmeter Plus is used with snowboarden. Wrist Guards Flexmeter Plus offer the maximum protection and support so are particularly recommended for those with any previous wrist injuries. Especially for multisports wereas the risk for wrist and hand injuries needs to be heavy reduced. Not to forget the ones who are learning sports were the risk of injuries on wrists are high. 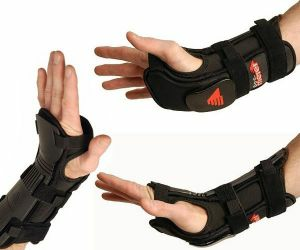 Docmeter Flexmeter wrist guards providing maximum protection against snowboarding wrist injuries.They feature a unique upper wrist splint which has been designed by a leading sports injury surgeon to prevent wrist injuries. This ?Plus? model comes with a molded plastic under splint and the added feature of a palm protector called PalmPro for enhanced protection. 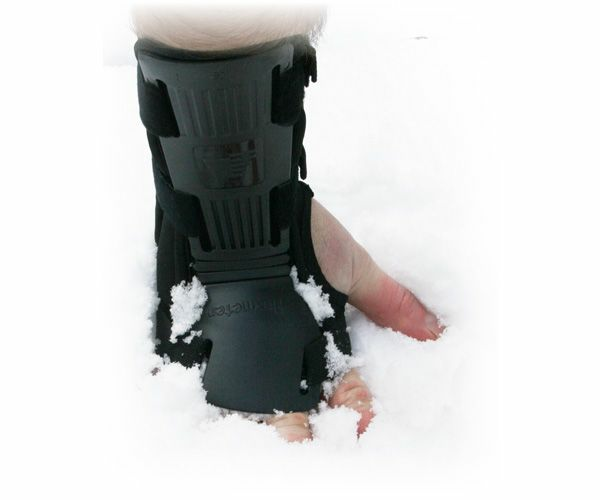 The PalmProis removable so it can be easily replaced if it becomes badly scuffed from outdoor use. 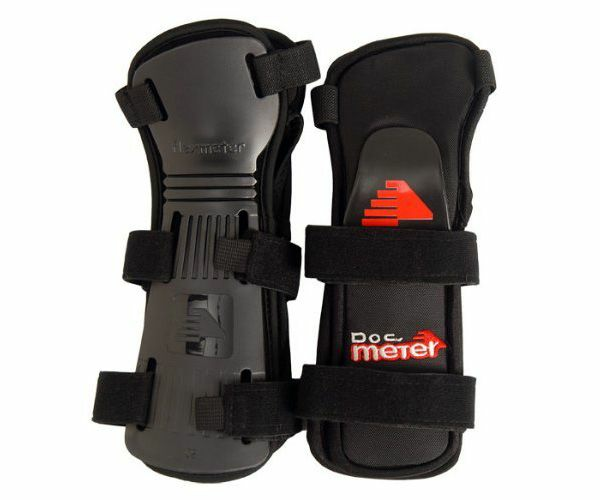 Docmeter wristguards Flexmeter Plus for protection protect your wristguard ! All the benefits of the original Flexmeter wrist guard with the unique upper wrist splint, to prevent hyperextension of the wrist. This surgeon designed splint protects and covers the full wrist and top of the forearm to prevent wrist hyperextension and to absorb compression forces. The Flexmeter upper wrist splint is flexible and durable, allowing high mobility of the wrist while protecting it against fractures and breaks.The upper wrist splint is made of thermoplastic Hytrel by Dupont, which provides enhanced flexibility and shock absorption. The Docmeter wrist guards are cushioned against the skin by softer materials including cotton and DuPont Lycra, making them very comfortable to wear.The wrist guards are secured by two adjustable strong Velcro straps for a precision fit. Especially recommended for beginners and a must have for those with previous wrist injuries! 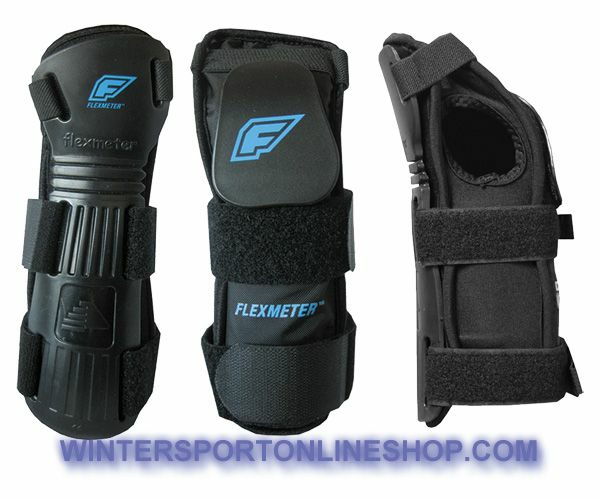 Flexmeter Plus multisports can be worn under snowboard gloves and mittens if there is plenty space left over. Measure your handcircumference, keep 4 fingers together than measure 1 time around over the hand the size in cm. Do not measure with the thumb closed to the fingers. Also the lenght of the hand the handlenght will be important, measure from your wrist till the end of your middlefinger.